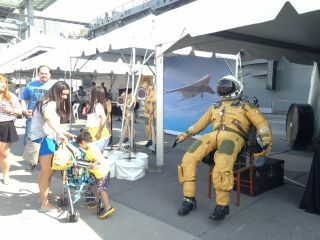 A suit sits inside a NASA booth at the Intrepid Museum's Space & Science Festival. NEW YORK — The seventh annual Space & Science Festival kicks off at the Intrepid Sea, Air & Space Museum here this week, and Space.com will be there to make Alka-Seltzer rockets and check out a host of other cool space-related activities and events. The museum — located at Pier 86 (46th Street and 12th Avenue) in Manhattan at a retired World War II aircraft carrier, the Intrepid — will host the event, which runs from Sept. 20 to 23. The festival will feature space and STEAM (science, technology, engineering, arts and math) activities and exhibitions, as well as talks from special guests, including NASA astronaut Sunita Williams and space entrepreneur Richard Garriott. Other special events include a defying-gravity augmented-reality experience presented by Microsoft and a free screening of "Star Wars: The Last Jedi" on the ship's flight deck on Saturday (Sept. 22). The museum will also debut its newest temporary exhibit on Thursday (Sept. 20). The exhibit, called "Personal Space," will be unveiled in the Space Shuttle Pavilion and will feature some of the personal items astronauts have brought with them to space. "Like anyone leaving home for a long trip, astronauts bring along personal possessions to remind them of family, friends and their life back on Earth," museum representatives said in a statement shared with Space.com. "This collection of personal objects offers a glimpse into the makings and motivations of eleven different space explorers. From a childhood toy to a grandfather's pocket watch, these reminders of home are as unique as the astronauts themselves." The full schedule for the festival is long, but Space.com has listed some festival highlights below. All of the 2018 Space & Science Festival activities are free, except for the concert by the London-based sampling band Public Service Broadcasting on Sept. 20. Presentations in the museum and the Space Shuttle Pavilion are free with museum admission. Space fans can journey to the edge of the universe during a pop-up planetarium show called "Giant Leaps: Exploration in the Space Age," which will be offered multiple times each day of the festival from 11 a.m. to 4 p.m.
On Thursday, Sept. 20, kick off the festival with the New York Institute of Technology to build your own rocket ship with the model kit company 3Dux Design, or learn more about the Exoplanet Exploration Program with NASA's Jet Propulsion Laboratory from 10 a.m. to 5 p.m. Families can look forward to an evening of space fun during the Family Astronomy Night on Friday, Sept. 21. Starting at 6:45 p.m., there will be presentations from special guests, including science writer Jeff Kluger, author of "Apollo 8" and "Apollo 13." Later in the evening, there will even be stargazing on the flight deck. Family Astronomy Night is free, but you can register ahead of time online. To wrap up the festival on Sunday (Sept. 23), you can sit in on a few space panels led by NASA experts. At 12 p.m., learn more about the scientific discoveries made aboard the International Space Station from NASA's Thilini Schlesinger and Steve Huning. Then, at 1 p.m., representatives from NASA's Goddard Space Flight Center will discuss the James Webb Space Telescope, which is set to launch in 2021. Be sure to visit the Space.com booth on Sept. 22 and 23, to try your hand at building small Alka-Seltzer rockets with film canisters! You can also enter a free giveaway to win an awesome new telescope provided by Celestron. You can learn more about the Intrepid Sea, Air & Space Museum and the Space & Science Festival by visiting intrepidmuseum.org. You can also keep up with all the Space & Science Festival fun on social media using the hashtag #SpaceSciFest.